Growing up I was surrounded by ample amounts of fruit trees, bushes, and plants. I can remember standing outside for what seemed like hours picking the plump blue purple colored fruit. Papa (Grandpa pictured in the photo) would hand us kids a bucket and lead the way. My sisters, cousin and I would always find the bush with the most berries on it, then race to see who could fill their bucket first. A few berries for the bucket, then a few in our mouths, eventually we always picked enough to bring Baba (grandma) to make into pies. Of course we had moments of spilling buckets of fruit while waving our arms like maniacs shooing away those biting torpedo flies, but we always managed to still get buckets upon buckets of blueberries. My daughter Elizabeth (she was 3 yrs. 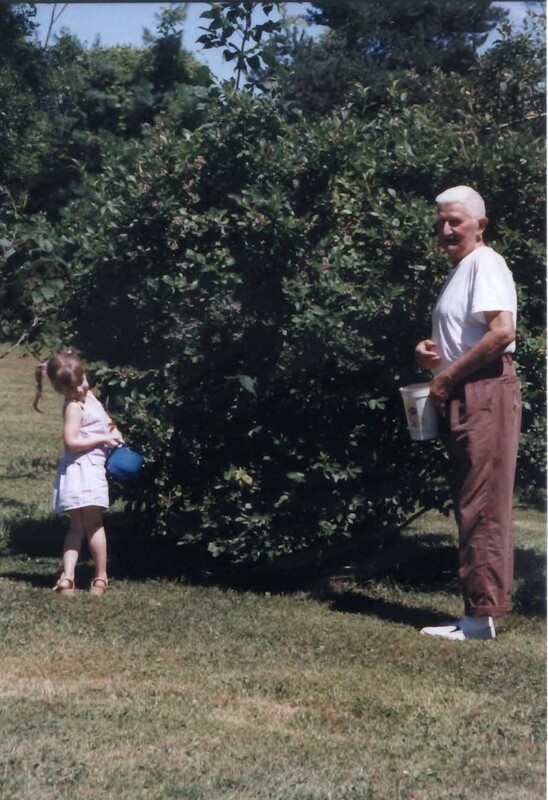 old in the photo) carried on tradition picking boo boos berries (Elizabeth’s toddler wording for blueberries) with Papa. At the young tender age of three more berries found there way into her mouth than the bowl but the picking process made for many yummy happy memories. If you’re looking to make someone’s heart swell with love or just have a taste for blueberries and cheesecake this is a must bake! This can be your new summertime love! 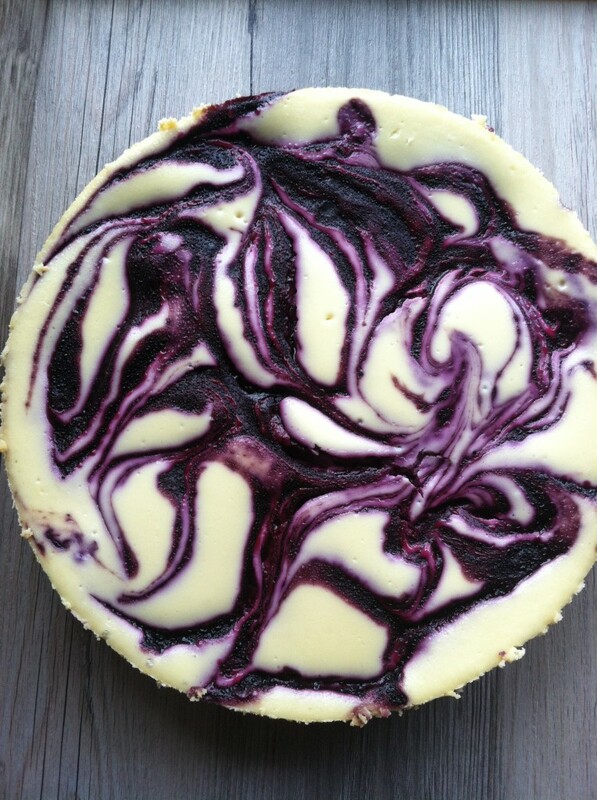 Cool, slightly dense cheesecake swirled with the satisfying taste of one of the best summertime fruits…blueberries! Combine the berries, sugar, lemon and cornstarch in a saucepan. Bring to a boil over medium heat (about 5 minutes). Puree in a blender or use an immersion blender. Cover blueberry puree with plastic wrap and let cool (quick way is to set the pan in a bowl of ice, stir occasionally until cooled). Preheat the oven to 350 degrees. Wrap the outside of a 9-inch springform pan with heavy-duty foil. Combine crumbs, sugar and butter in bowl; mix well. Press evenly into prepared pan and bake 10 minutes. Cool. Beat the cream cheese in a mixing bowl until light and fluffy. Gradually add sugar and beat until completely smooth. Beat in sour cream and vanilla. At low speed, beat in eggs one at a time, then flour just until blended. Pour batter over crust. Place springform pan in a larger baking pan. Carefully drizzle/spoon blueberry puree over batter. Swirl knife through batter to marble-size. Place baking pan in the oven. Pour boiling water into the larger pan 1-inch up side of the springform pan. Bake 1 1/4 hours or until just set. Remove springform pan from the water bath. Remove the foil; cool completely. Cover and refrigerate 5-8 hours or overnight. Run a knife around the sides of the pan. Remove the sides of the pan. 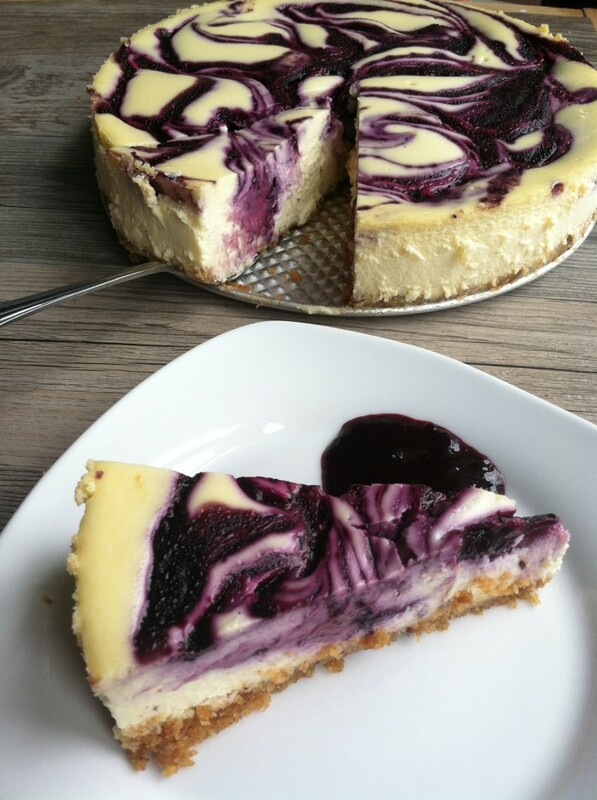 Tip: I leave some of the blueberry puree out of the cheesecake. Having some left over to dollop on the side of the plate or on top of individual servings.